Its such an awesome project Dr. Sonia. I am awed by your detailing... No proper words really... Hats off to you..
WOW DOC ...this shows how excellent you are and your daughter-what we say"subhanallah"you both are perfect team.love you both.each and every detail on chart is eyecatching ,rolling up and down to see this and that and still not satisfied .CHEERS lovely project. Wow! How fun and interesting. Interactive charts always draw attention and interest. Great flowers and wonderful project. Very nice and interactive project! Love the idea of those windows which open up for the write-up. Loved it. If everything was taught in such a beautiful way, the kids would find the fun in it. Keep up the good work and keep posting. I am hardly finding time from my day to day : ( but, Its a treat to see what others have done :)So always waiting for your email. So beautiful, Sonia - all of the elements are gorgeous! Wonderful project! 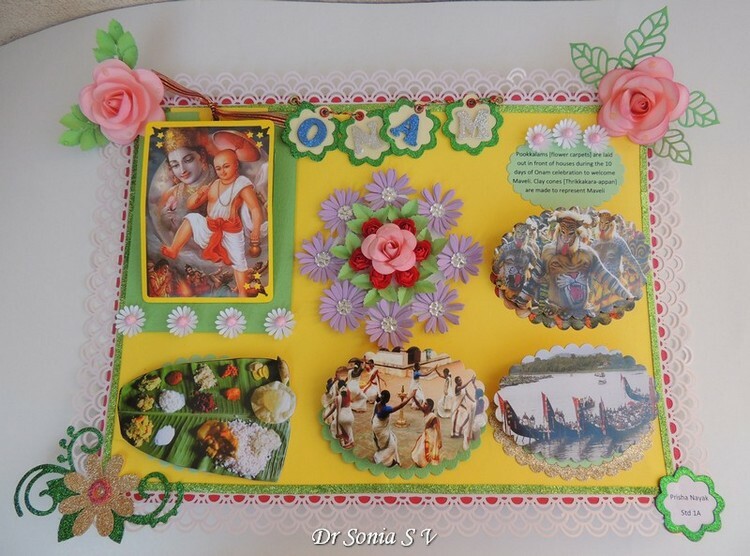 Beauty of the Festivals of India in miniature. Little lesson for us from the rest of the world. stunning project Sonia - how you have managed to pack in so much in a small space without looking cluttered is an art in itself. Your festival looks so inviting and colourful especially as we are in a pretty dull time of year just now - grey skies. Like the animal images on the people & the layers that open up. Melissa seeing those dancers in person is a sight to behold!! I do miss Kerala!! Oh wow! What an amazing project! I can see the effort that was put into this project! Thank you Yvonne...yes I did put my heart and soul into it! Sonia!! 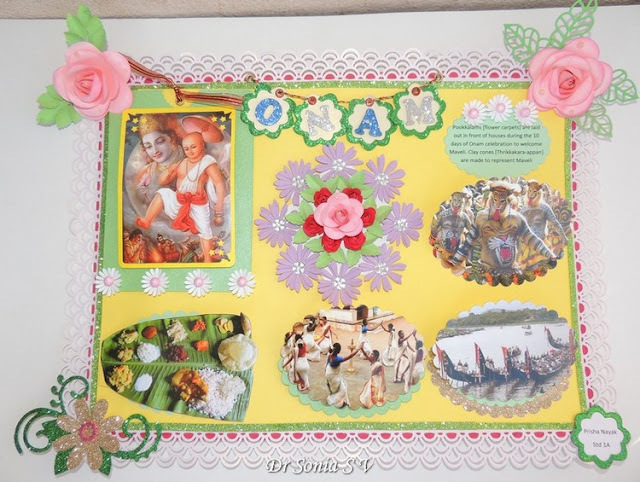 I would nt have imagined making a school project like this!!! 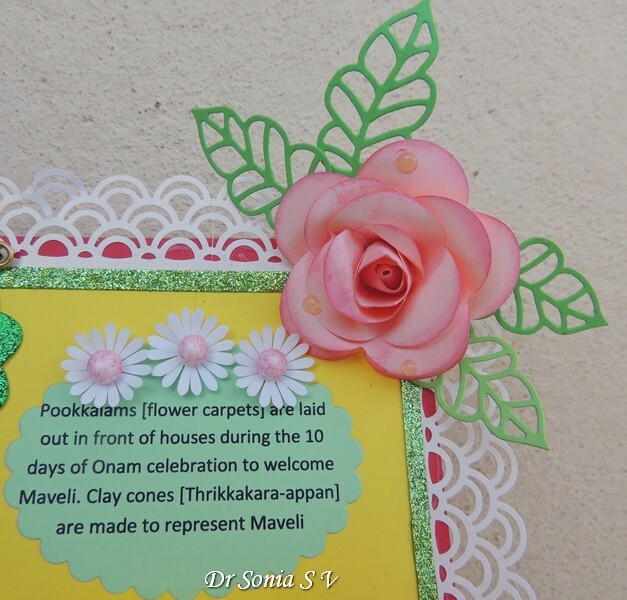 so detailed, even a foreigner would understand ONAM!! Good work!! coz of my bad time management, I missed posting in my blog.. will do it soon!! The toughest part was figuring out printing from microsoft word...fortunatley my hubby rescued me there! Hussena I would be delighted if you use any idea...that is the whole point of sharing!! Awesome and the plantain leaf and dishes look so real! Wow, what a fantastic project. How much fun the two of you must have had creating. I am sure the children in the class will love it, with the bright colors and it be interactive!! Thanks for the awesome history lesson as well!!! 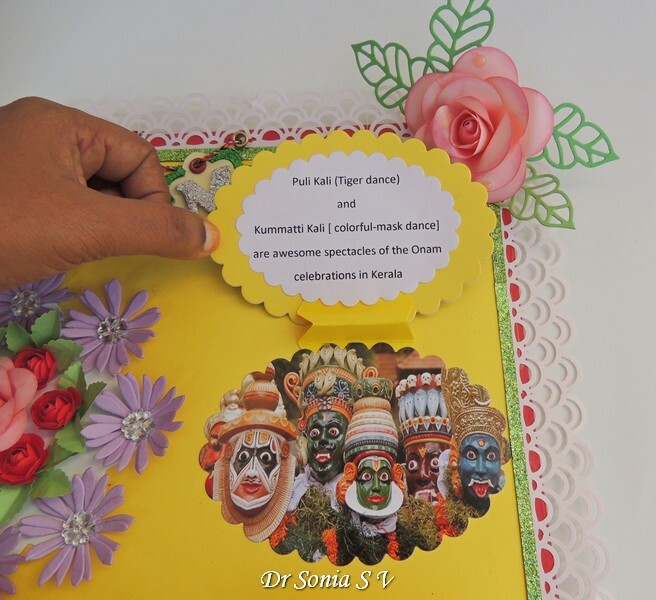 Great project.Really like how you applied all your crafty techniques in there.Glad to know so much about Onam too.Didn't know that much about the festival. 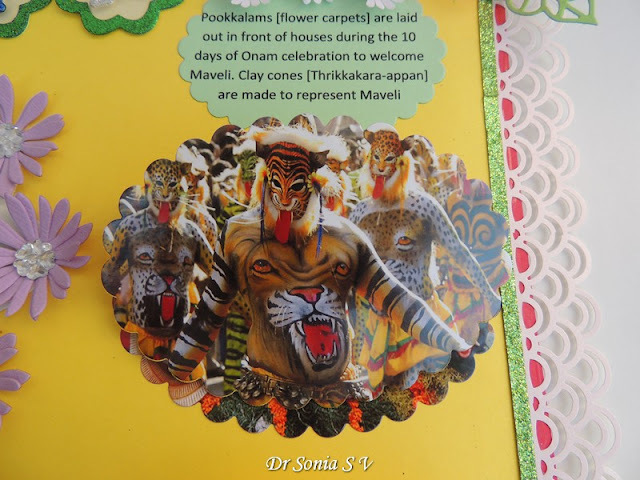 A very detailed project and one I bet your daughter learned a lot from making. Superb! so informative. Flip open info is great idea. Wow Sonia I've never seen anything like this before, and I'm sure in real everything must be a real eye opener.. Love all your details to this terrific project that you created for your daughter's school project. Love how you can open up each picture and it has a little saying to it.. Wow you should be given some type of award for this presentation. It is just mouth dropping! Such a pretty project!!! Its truly wonderful and no doubt the teacher must have been amazed!! What a marvelous job on this project. I bet her teacher was completely floored. 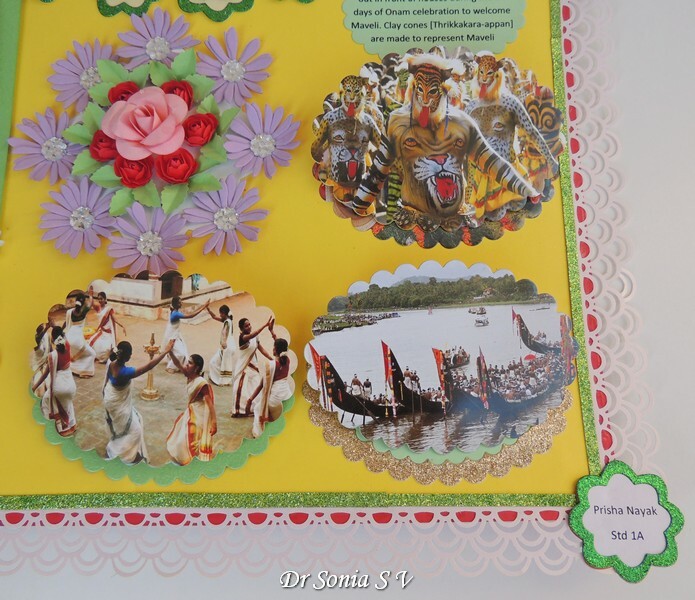 Amazing project and thank you for a wonderful lesson on culture. wow what a gorgeous layout, love it !!!! I never imagined a chart could be made this interactive. 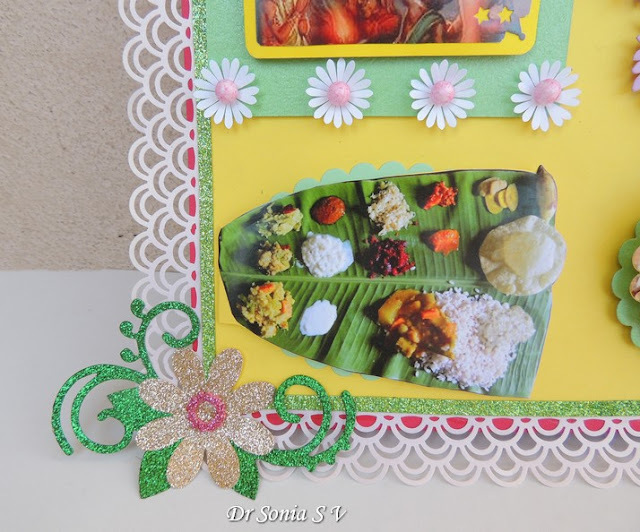 The sliding pop-up is wonderful.I had been in kerala for a month for training and since then I have fallen in love with this beautiful state.clever idea to use punched flowers for pokkalam and onam sadya looks yummy. Oh wow, this is amazing, Sonia!! What a beautiful project!! The layout is fabulous and the design is gorgeous!! I loved reading about all the festivals!! You are so creative and talented - this is stunning!! OMGoodness thanks so much for sharing this project with us. It is so interesting to see what each event is. The flowers are stunning. I'm sure her teacher was happy to see how good she did on her project. Doc !!!!!!! !Wat a creativity...Loved the project totally!!! Very very interactive project! nice polkallam! the colours are in harmony. Wow...such a fabulous project. i like this. WOW! I love all the bright colors and as always so very beautiful!! Thank you for stopping by and have a fantastic Monday!! 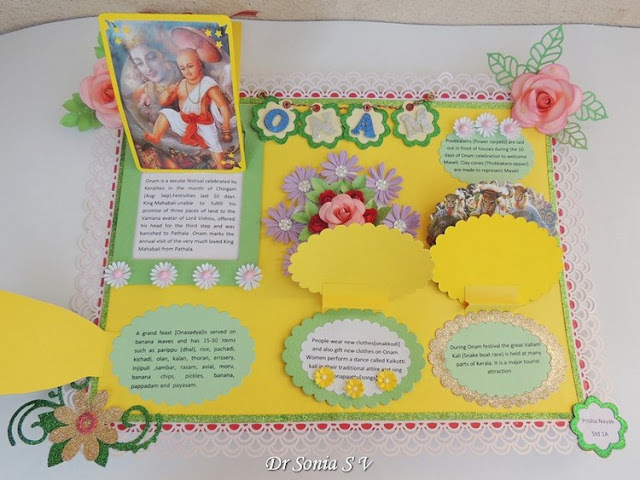 Excellent Project... What are the flowers made of? Paper and cardboard? Or any clay flowers there? Most importantly the way you used limited space to narrate all is superb.. 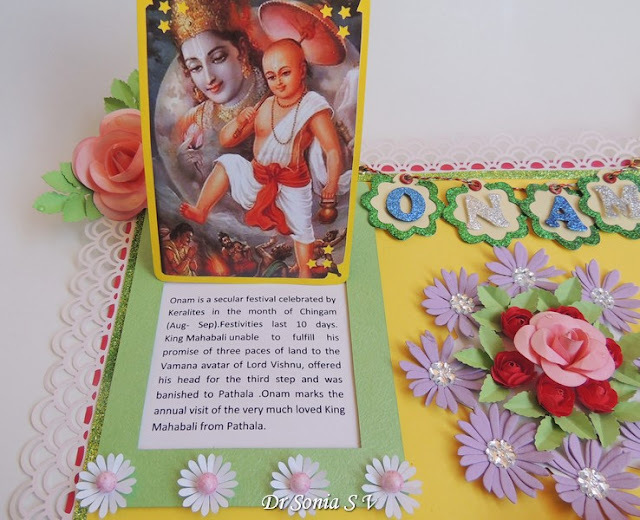 Thank you so much Sravani...all the flowers are made of paper.The pink center of the white flower is a thermocol ball bought from local market and the shiny center of the purple flower is a kundan bought from a local fancy store. What an amazing Mum you are. I bet your daughter had such fun creating this with you. Each panel is so interesting. Thanks for explaining everything...it sounds like such a festive and colourful time. Such an brilliant project Dr Sonia..so informative and interesting along with being creative..your daughter is truly lucky..I have been to Kerala and I think it is amongst the most beautiful places on earth!! 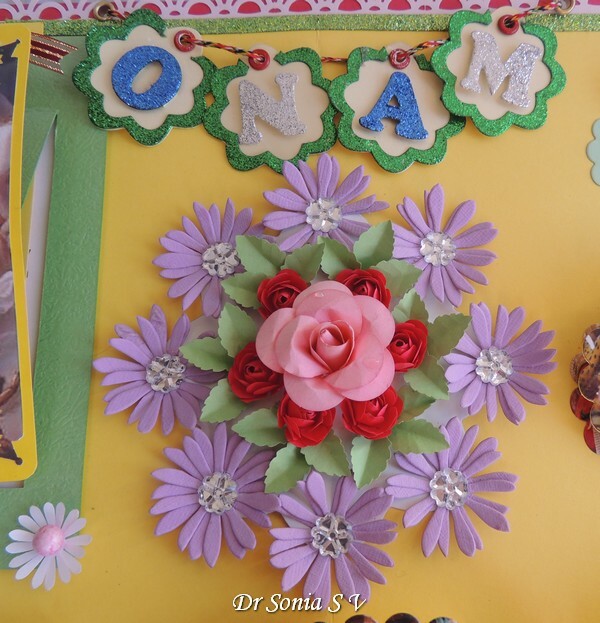 You are a rockstar mom Dr Sonia. Loved the idea and the concept. I have a tiny tot and home and they grow up really fast, so by the time you realize, they are already in pre-school and then nursery! I have been following a new parenting blog Humpty Bumpty Kids and came across this read: http://www.humptybumptykids.com/tips-to-start-maths-for-kids/. Got me thinking...How will I get my child to get to do Maths? Wow...parenthood is something!! Reshmi thank you for the rockstar compliment!! And the school curriculum is so much advanced these days..my 6 year old is already learning the multiplication table! Wow, what a wonderful festival I can't wait to show my daughter these photos!! Your daughter must have been so thrilled with her chart:-)). Must have taken you quite a few days to assemble everything. Kudos!!! This is a fabulous project. Thank you for joining us at Craft-Room Challenge. How lucky is your daughter to have such a fantastically creative mum. Love her project and all the flowers and stuff you have on it. Thanks for sharing it with the rest of the world. Good for the world to see how many religions and ceremonies exist peacefully in India. Sometimes I wish I was a practicing journalist... I would tell the world of all the good things that happen in India. Hey this is really an awesome project.. Knowing the technique and implementing it are 2 different things. And u have implemented all the possible techniques beautifully in this card. LOvely!!!! Just a small doubt... What is the food that u have put on the banana leaf?....are they pictures? Thank you Bijal...The leaf with the onasadhya is a pic from the net...I cut it in the leaf shape and stuck it. 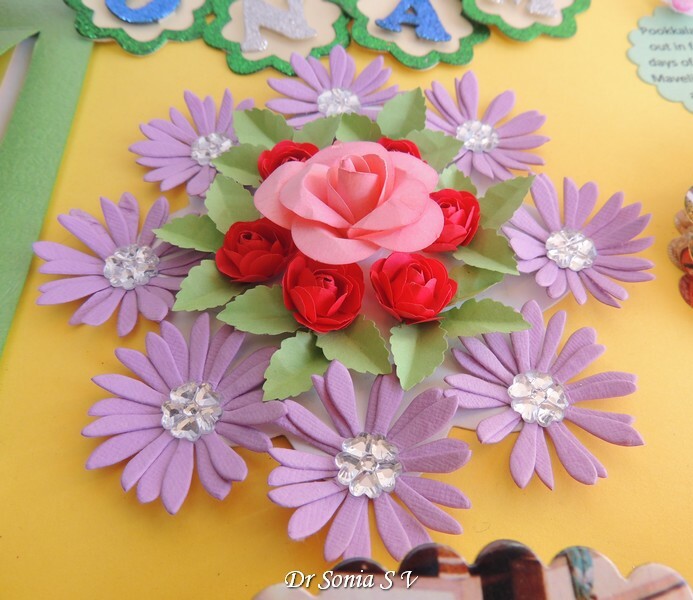 I originally thought of quilling some food but later thought it would clutter the project. 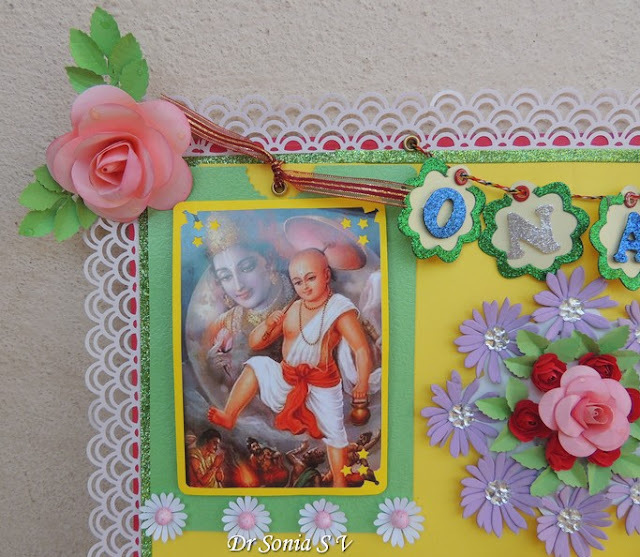 Ok..am a new follower and have used alot of ur techniques in my cards too. i do not blog....but have a small FB page www.facebook.com/PygmyArts Making flowers they using ur techniques is Super Easy!!! wow, what a beautiful creation! So brilliant and creative design. I love it! Happy onam to you and to your family! I really love this craft !! It really helped me make mine as well. I love your crafty ideas ! !